Dmitri Minaevich Sinodi-Popov (1855-1910) - Russian artist of Greek descent. Dmitri Sinodi-Popov received good home education, he played violin, spoke French, Italian and Greek languages and was very good at visual arts. In 1870, Sinodi-Popov entered the St. Petersburg Academy of Arts, where the amateur artist acquired good practical skills, but he had to interrupt his studies due to suffering from epilepsy. In late 70s of nineteenth century, the artist returns to the home city of Taganrog, continues his art studies and paints a lot. Most of sketches available at Taganrog Museum of Art and Taganrog State Museum date back to late 1870s - early 1900s. Most part of visual heritage left by the artist are drawings. His portraits of local Greeks are very expressive: "Portrait of Doctor Divaris", "Greek Boy" and "An Old Greek" (1870). Since 1880s, the artist works in the current of Peredvizhniki traditions. "The portrait of the artist Seraphima Blonskaya". This artwork goes beyond the boundaries of its genre and transforms into a portrait-painting. 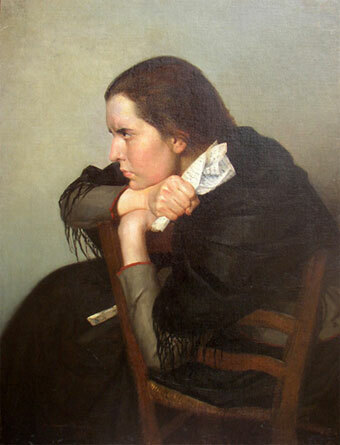 The image of the young woman conveys seriousness and simplicity. Sinodi-Popov exhibits in Europe and his name becomes known, bringing new orders and fans. But with his illness progressing, the artist goes for medical treatment to Rome and later - Paris, where he dies in 1910.